Last Sunday, we once again awoke at 5:30 am to enjoy a full day of skiing. This time we headed to Davos which is about 2 hours from Zurich. The conditions were sunny, clear and not too cold when we arrived. The snow was good but not great since it hadn’t snowed in a couple of days. You can see that we did some narrow runs that went through the trees! We typically don’t do these because they make me tense up in fear that I’m going to lose control and go barreling into a tree or right off the cliff. However, we were feeling adventurous and it was actually pretty fun. Around 1:00, we stopped for lunch and the winds really picked up! At our chosen restaurant, there were no seats available inside, so we sat outside on the picnic tables. This was a mistake! The wind was too much. The clouds rolled in and covered the sun and it was so cold! I was shivering and our food got cold in a matter of minutes. I’ve never eaten Rösti so fast. And I ordered an Apfelschorle to drink which froze as soon as I opened it. We tried to warm up with some coffee, but that wasn’t very successful. We decided to get back on the slopes hoping that would warm us up, but the wind was too powerful. We were only able to do about 3 more runs before we decided we were too cold. So, we left for a nice Après-Ski and then hopped on the train back to Zurich. 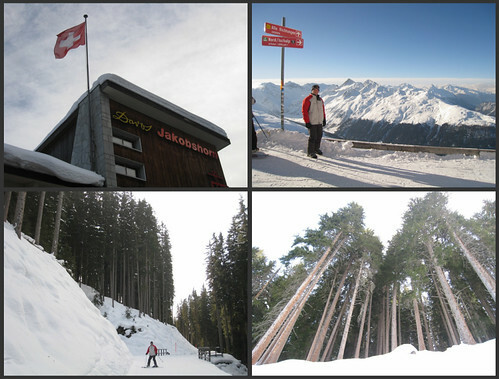 As we were only on Jakobshorn mountain this time, we will definitely go back and check out some of the others.